China has a long and storied Jewish history dating back to at least the eighth century. Many Jews also came to China seeking refuge from Nazi Europe. Today, the Jewish population in China is approximately 2,500. For hundred of years, the Silk Road served as a link between East and West. Before the perfection of maritime navigational techniques, it was the primary route of trade between China and its eastern neighbors. Different routes of the Silk Road took goods and people from China to India, to Persia, to Arabia, and to the Mediterranean Coast, which then connected to Europe and Africa. During the time of the Silk Road, many Jews become involved in international trade. In many ways, they were uniquely qualified for the profession. There existed significant Jewish communities in India, Persia, the Arab nations, and in cities throughout Europe; in almost all these communities, a good number of Jews were already merchants. While most Arabs and Persians could not speak Russian, Greek, or Italian, Jews in Persia, Arabia, and Europe all knew enough Hebrew to communicate with each other. Thus Persian and Middle Eastern Jews had a much easier time trading with European Jews than Arab Muslims did with European Christians. As tensions between Christians and Muslims heated up around the time of the Crusades, many of them refused to or were not permitted to trade with each other, while Jews throughout the world had no problem selling goods to their kinsmen. Persian Shiites and Arab Sunni Muslims would sometimes be at war with each other, or with Hindu Indians or with Christian Europeans, yet the Jewish community stayed united and continued trading between countries. As there were a disproportionately high number of Jews in the trading profession, it should not be surprising that some of these Jews became involved in trade with China. Up until the past century, there was a significant Jewish population in Persia, and since the Persian Jews traded with the West, there is no reason to think they did not trade with the East as well. Although there is no evidence of the existence of a Jewish community in China before the Song Dynasty, a few historians still claim that the Kaifeng Jewish community was founded in 200 CE or earlier. Most evidence supports the theory that a significant number of Jews, hundreds or perhaps thousands, migrated from Persia to Kaifeng some time during the Northern Song Dynasty (960-1127). Some historians believe the Jews of Kaifeng originated in Bukhara, a city in Uzbekistan that was once part of Persia. A 1489 inscription states that 70 families came to Kaifeng, although it is unclear as to whether this meant 70 clans (surnames) or 70 families (households). No one can say for sure why this mass migration occurred; perhaps there was a famine, drought, or other natural disaster, or maybe local Persian authorities were hostile to the Jews. It is also possible that these Jews had been drawn to Kaifeng by tales of the city’s beauty and comfort, yet one can only speculate why such a large group of Jews would leave Persia, a nation where they had lived since the Babylonian Exile in 586 BCE, to venture to the distant and unknown city of Kaifeng, China. While a cloud of mystery remains around the Jews’ long trek and early years in China, the history of the city they traveled to, Kaifeng, is well known. The Jewish migrants entered Kaifeng during its most glorious years, as between 960 to 1127, Kaifeng was the capital of Song Dynasty’s China, and is believed to have had a larger population than any other city in the world at the time. All evidence seems to indicate that the Kaifeng Jewish community enjoyed its early decades in the city, as a pillar at the site of their synagogue states that the Song Emperor invited them to stay in Kaifeng and practice their religion freely. The Jews, who kept giving their children Hebrew names for their first eight or nine generations in China, kept their religion yet immersed themselves in Chinese culture and society. Perhaps no two cultural groups revere scholarship more than the Jews and the Chinese, and this common bond perhaps made the Jews feel at home. While some Jews continued to be merchants, a profitable yet less respected profession, the most talented became scholars of either Jewish culture or Chinese culture. The scholars of Judaism because Jewish leaders, while a great number of Jews studied to take China’s prestigious civil service exams, which Jews passed disproportionately. While the pillar states that the Jewish community arrived during the Song Dynasty, it does not state what year or the name of the Emperor. The city of Kaifeng was ravaged in 1127 by Jurchen invaders, who conquered most of Northern China, forcing the remains of the Song dynasty to flee south, where a new Song Emperor continued to rule over Southern China from Hangzhou. When the Jurchens established the Jin Dynasty over Northern China, Kaifeng was decimated, and more than half the population either died or left the city. A pillar outside the Kaifeng synagogue infers that a significant number a Jews fled with the imperial family to Hangzhou, the new Song capital. This disaster leads many historians to speculate that the Jews moved to Kaifeng at least 40 years before the chaos of 1127 theorizing that the Jews would have all left the city had they not spent several good decades there. Likewise, since Kaifeng must have been a large, attractive city before the Jewish community decided to migrate there, historians think that the large Jewish community migrated there sometime in the 11th century. After the attack on Kaifeng, the city was taken by the Jurchens and became part of the Jin Dynasty, when it lost the prestige of being a capital. Much of the city was destroyed, and it took several decades for the city to be rebuilt. Although some Jews left the city, the city’s destruction offered those who remained the opportunity to buy more land when the city was rebuilt. The Jewish community took advantage of the opportunity, and built their first synagogue in 1163. Yet the Jewish community in Kaifeng always had fond memories of the Song Dynasty, and continued using the Song calendar even after the Jin took control, as the synagogue dedication pillar was dedicated using the Song calendar date to write the year 1163. Due to the war with the Mongols in the North, the Jin moved their capital to Kaifeng in 1214, where it remained until the Jin dynasty fell to the Mongol in 1233. While Kaifeng never served as a Chinese capital again, the Jewish community of Kaifeng would continue to flourish for centuries to come. In 1233, the city of Kaifeng fell, along with the entire Jin Dynasty, to the Mongolians, who later established the Yuan Dynasty in China. As neither the ruling Mongols nor the Jews were ethnically Chinese, the Jews were among the groups that benefitted when the Mongols dropped all laws that gave the Han majority legal advantages over minorities. As the Mongols distrusted the Chinese, they ended the civil service exam system that had been used to select government officials. As a way of decreasing Han power, they place foreigners, such as Jews, in positions within the bureaucracy. Yet there were also disadvantages to Mongol rule, as a 1280 Yuan degree banned all Jewish and Muslim ritual slaughter because the Emperor felt insulted that certain subjects felt that the meat fit for him was not good enough for them. Additionally, it is important to note that the Yuan era was a time of great migration movement throughout them empire. As the Mongols brought many slaves back from Persia and Arab states, it is likely that some Jews were brought to China as slaves. Perhaps after securing freedom, some of these Jews came to China’s Jewish capital, Kaifeng. This may explain how Jewish practices from Yemen, as well as from the 13th Century Rabbi Maimonides came to Kaifeng, as many of their liturgical traditions and prayers were not around before Jews moved to China. In 1368, the Yuan were overthrown and the Han once again ruled Kaifeng, meaning Confucianism and Chinese tradition regained their role in society and in people’s lives. Unlike Jews in many other nations, Chinese Jews could fully engage in society, including public affairs and government service. In 1390, the Jews were granted additional land and privileges; in 1421 they received permission to rebuild their synagogue, and the Jews placed an imperial tablet in the synagogue in the Ming Emperor’s honor. As the Jews of Kaifeng became more prosperous, they added more buildings to their synagogue compound in the 1440’s. A 1461 flood destroyed the synagogue, but the community rebuilt it soon after, and obtained new Torahs from the Jewish communities in Ningbo and Yangzhou. Not only were the Jewish people successful in their own community, but they also were productive members of Chinese society during this Golden Age. A disproportionately large number of Jews passed the Chinese Civil Service exams during the Ming Dynasty. Four different inscriptions from 1489, 1512, 1663, and 1679 list the names of 80 different Kaifeng Jews who passed the exams and became Chinese officials. Additionally, the 1663 inscription lists 241 names, including 21 community officials and 38 civil, military, scholar, and medical official in Chinese society. These numbers are incredible coming from a community of under 5,000 people. Some Jews even received high imperial posts; for example, in 1423, a Kaifeng Jew named An Cheng was rewarded the name Zhao Cheng by Prince Ting of Chao. He was promoted to be the assistant commissioner of the Regional Military Commission on Chekiang. Jews were often very successful as Chinese officials, as throughout the Ming and Qing Dynasties, there are records that show at least three Jews were awarded the title Kung Sheng, one was awarded the title Gong Sheng, five Jews were awarded the title Ju Ren, one Jew reached the incredibly high status of Jing Shi, and another served as the official physician to the Prince of Zhou. Thus, it should not be surprising that the social status of the Jewish community rose significantly during the Ming Dynasty. Clearly, the most important sources of information about the Jewish population of Kaifeng come from the four inscriptions made outside the site of the synagogue. These four inscriptions, made in 1489, 1512, 1663, and 1679, all commemorated the rebuilding or renovation of the synagogue. They all mentioned the names of non-Jews who contributed to the rebuilding of the synagogue. The fact that each successive inscription had more and more important non-Jewish names on it indicates an increase in the status of the Jewish community. Unfortunately, there were negative effects of the secular successes of Chinese Jewry. Many of the greatest Chinese Jewish minds went to study the Chinese Classics in preparation for the civil service exams. These talented Jews could not have had time to learn Hebrew or much about Judaism, so they had to abandon religious studies to succeed in the secular world. This “brain-drain” undoubtedly harmed the community, as many officials were also moved to other cities when they received promotions, as was common at the time. The Golden Age of Kaifeng Jewry ended abruptly in 1642, when the Ming Army broke the Yellow River dams to quash a peasant rebellion. Unfortunately, the plan backfired, and roughly half of the 600,000 people living in Kaifeng were killed. It is estimated that a similar percentage of the Kaifeng Jews died, as historians believe that the city’s Jewish population shrunk from almost 5,000 to under 2,500 people. As in most Jewish Diaspora communities, the practice of the Jewish religion in Kaifeng took on some aspects similar to the practices of the native Chinese. This is not to say that the Jews of Kaifeng fundamentally altered their religion; quite the opposite is true, as the Jewish religion maintained its integrity and unique monotheist aspects for centuries. It would be more accurate to say that the Jews in China naturally focused on the values within their own religion that were compatible with the native Confucian way of life. Judaism is in many practical ways, a very flexible religion, as Judaism has adapted to its surroundings while keeping its core theological tenets, moral values, and religious identity intact. This adaptability allowed Judaism to survive outside of Israel and gave Jews the ability to flourish in almost any culture they are transplanted to. American Jews, for instance, give their children gifts for Hanukkah because they saw this as a harmonious cultural counterpart to the American Christians’ practice of giving gift on Christmas. Non-American Jews would never think of giving gifts in December, as there is no reason to, yet American Jews began the practice in order to fit into their surroundings. Similarly, although polygamy is permitted in the Jewish religion, Rabbi Gershom ben Judah issued a rabbinical ordinance 1000 years ago forbidding all European Jews from practicing polygamy. Rabbi Gershom did this not because Judaism forbade polygamy, but rather to allow Jews to fit in better with their neighbors; to this day, there is no Jewish law forbidding non-Ashkenazi Jewish men from having multiple wives. It is necessary to view the Kaifeng Jewish community through this context to better understand what effect Chinese culture had on their religion. In truth, the Jews of Kaifeng held remarkably faithful to their religion for an incredible amount of time considering their small number and near isolation. 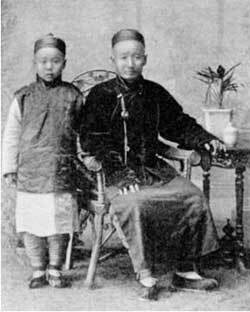 Kaifeng Jews continued to give their children Hebrew names for an incredible seven or eight generation before adapting only Chinese names. In contrast, many American do not have Jewish first names, and many altered their surnames upon entering the country. For many generations, most Jews in Kaifeng had their children learn Hebrew in the city’s synagogue. The Kaifeng synagogue was built in 1163, and it was rebuilt, renovated, or enlarged at least a dozen times over the next 700 years by the generations of Jews who made use of it. While the building had Chinese architecture, the Jewish synagogue differed from all other Chinese places of worship in that there were no idols or pictures inside. During their time in Kaifeng, the Jews embraced many elements of Chinese culture, yet continued to adhere to their own faith. Interestingly, the Jews of Kaifeng did, however, adapt the Chinese practice of ancestor-worship. Perhaps because of the similarities between this and the Jewish custom of Yizkor and Yahrzeit services for the dead, Jews seemed to find this practice acceptable. Since there is nothing in Judaism to prohibit such practice, the Rabbis of Kaifeng must have concluded that it could be done, although it must be done in a Jewish way. The Chinese would burn incense and give offering to tablets and depictions of their ancestors; the Jews, however, would burn incense and leave offerings, but they would never allow themselves to worship or leave an offering to any depictions, as that would border on idolatry. This practice became so common among Kaifeng Jews that a “Hall of Ancestors” was built for that purpose. While some practices the Kaifeng Jews adapted were adaptations they chose, they also yielded to the Chinese Imperial law when it conflicted with their practices. There are two good examples of how Jews dealt with these legal conflicts. For instance, according to the Torah, if a husband dies before giving his wife her first child, the eldest surviving brother of the husband is required to marry his brother’s widow. This conflicted with Chinese custom, and the Yuan Dynasty made such marriages illegal. The Jewish community in Kaifeng was forced to yield to Chinese law. In another example, a Chinese emperor demanded that a portrait of him must be in every house of worship. Even though this conflicted with Jewish custom, the Jews did put up the portrait in the entryway of their synagogue. They did, however, write in Hebrew the holy prayer the Shema above the Emperor’s picture. The Shema, which is translated as “Hear O Israel, the Lord is our God, the Lord is One. Bless His Glorious Kingdom Forever and Ever”, is the central statement of Jewish theology and was written above the portrait to remind Jews that the one God is above even the Emperor of China. It appears that for most of their existence, the Kaifeng Jews practiced most traditional Jews customs and rituals. They clearly kept the Jewish dietary laws, as they were known to only eat meat they slaughtered according to the laws of Kashrut; even some of their descendants today do not eat pork. The Chinese even called Jews “The Sect that Plucks Out the Sinews” in reference to the Jewish custom of removing the thigh muscle from Kosher meat. They also established ritual bathes, cemeteries, and charitable institutions. They read Torah, taught their children Hebrew, and even ritually circumcised their sons. They built and rebuilt their synagogue at least nine times, which they referred to as “The Temple of Purity and Truth.” They observed Jewish holidays, and had a Rabbi until the 19th century. Kaifeng Jews wore blue kippot, although besides that the Jews wore the same clothes as the rest of the Chinese. In terms of marriage, it appears that in the early days, the Jews married only within the community. As time went on, it seems that Jewish men marrying Han or Hui wives became more acceptable, although almost all Jewish women married Jewish men. This was possible because polygamy was legal ad acceptable, although it is likely only wealthier men could afford it. As the community got smaller, the Jews ended up permitting their daughters to intermarry, although sources claim that families preferred their daughters marrying Muslims if Jewish men were not available, as there were some similarities between Judaism and Islam. The 1670 Memorial Book listed 49 wives as “Children of Adam”, meaning they were not born Jewish, indicating an intermarriage rate of about one in four (compared with a nearly one in two intermarriage rate in the American Jewish community today). This may explain why all Kaifeng Jews today look Chinese. It is also important to note that the Jews of China were not entirely isolated during their early centuries there. Certain Yemeni practices indicate that some Yemeni Jews must have entered the community. Furthermore, the Jews of Kaifeng practiced some of the legal interpretations of the famous Rabbi Moses Maimonides, who was born in 1135. As the Jews entered Kaifeng before 1135, this proves, that there must have been some contact with the outside Jewish community, and that the Kaifeng Jews updated their Jewish customs along with the rest of the Jewish community that they had contact with. As stated earlier, a 1489 inscription states that 70 families came to Kaifeng originally during the Northern Song Dynasty, although it is unclear as to whether this meant 70 clans (surnames) or 70 families (households). Some historians believe that this meant 70 families and 17 clans, as historically as many as 17 surnames can be linked to Kaifeng Jews. The population grew and shrunk throughout the decades through growth, as well as through mass migration and natural disaster. Many Jews left the city when a Jurchen attack became apparent in 1127, and other Jews left after the attack to live in the new Song capital in Hangzhou. However, even despite this exodus, a 1679 inscription states that there were 73 clans, and more than 500 families altogether when the synagogue was built in 1163. Many floods plagued the city throughout the centuries, which caused both the Han and Jewish population to shrink, the largest of which occurred in 1642, when a flood destroyed much of the city. For the first seven or eight generations in China, it appears Jews continued to give their children Hebrew names. Eventually though, likely during the early Ming period, all Kaifeng Jews adapted Chinese names, and the 1489 inscription lists Jews with 17 different Chinese surnames, including Li, Yen, Ai, Kao, Mu, Zhao, Jin, Zhou, Zhang, Shi, Huang, Nie, Lí, Jín, An, Zuo and Bei. According to the Kaifeng Memorial Book, a book which documented all of the deaths in the Kaifeng Jewish community for many years ending in the 1670s, by the 1600’s all Chinese Jews had one of seven surnames: Zhao, Zhang, Li, Ai, Kao, Jin, or Shi. Most likely, the other ten clans were either killed by the 1642 flood, or left the city for other reasons. All seven clans played important roles in the Jewish community, and there were many families within each clan. Here is a list of the number of families in each clan mentioned within the book. In all, 241 families were mentioned, indicating a Jewish population of 1,000-2,000 in the city in 1670. Wang Yisha, a Kaifeng scholar, believes that the number of Jews living in the city before the flood could be estimated by the number of the synagogue’s Torah scrolls. Thus, according to Wang, there were over 500 Jewish families in Kaifeng before the flood, indicating a population of three to four thousand. Considering Kaifeng’s total population was more than cut in half by the 1642 flood, it would make sense that there were over 500 families before the flood and only over 240 in the city by 1670. A Jesuit named Gozani who visited in the early 1700’s estimated a population of two or three thousand, which is consistent with the estimates of modern scholars. To compound losses, many Jewish and non-Jewish Chinese died or left the city in the 1850’s when Kaifeng was sacked during the Taiping Rebellion, which severely damaged the city’s economy. By the end of the 19th century, historians estimate only several hundred Jews lived in Kaifeng. Even more Kaifeng Jews were likely displaced during the Japanese Occupation, which left the Kaifeng with only half of its pre-war population. Although some allege that there were Jews in China as early as the Han Dynasty, this is only speculation, as the earliest evidence of the existence of Jews in China was from the Tang Dynasty. A few letters in Hebrew and Judeo-Persian written on Chinese paper were found in Northwest China, dating back to 718 CE, and were likely written by Jewish traders. Additionally, a traveler named Abu-Zaid explicitly mentioned that Jews were killed during the 877 massacres of foreigners in Khanfu, which was likely the port city Canton. During the Tang Dynasty, the city of Xi’an, which was frequented by Persia merchants, likely had the first settled Jewish community, as a Chinese poem mentioned Jewish people living there. The Jews of Kaifeng were not entirely isolated from all other Jews, as records indicated that Jewish communities existed to some extent in at least four other Chinese cities at the time, although far less is known about these communities than the one in Kaifeng and they do not appear to have lasted as long. Hangzhou, Ningbo, Ningxia, and Yangzhou all contained Jewish communities that were in contact with the Jews of Kaifeng. The Jews of Hangzhou, the Southern Song capital, likely came from Kaifeng around 1127 when the city was sacked. Ai Tien, a Jew from Kaifeng who met Matteo Ricci, a Jesuit Priest and missionary, in Beijing in 1605, told Ricci that a significant number of Jews had once lived in Hangzhou and even built a synagogue. Ibn Battuta, an Arab traveler who visited the city in 1346, also attested to the existence of Jews in the city and claimed to have seen a gate called “Jews’ Gate”. The community for some reason ceased to exist before Ai’s 1605 meeting with Ricci. Outside of Kaifeng, it seems that the largest Chinese Jewish community of the era existed in Ningbo, which was a major port city. The Ningbo community must have been observant and likely had a synagogue, as in 1461, they donated two Torah scrolls to the Kaifeng Jews after their scrolls had been damaged in a flood. The 1489 inscription in Kaifeng mentions good relations with the Jewish community of Ningbo, which must have been fairly large if it could spare two Torah scrolls. Like the rest of the Jewish communities outside Kaifeng, Jewish life in Ningbo seems to have ended by the year 1600. There were Jews in other cities as well who were in contact with Kaifeng and were mentioned in the inscriptions. According to the 1512 inscription, some Jews from the city of Yangzhou contributed a scroll to the Kaifeng synagogue, and helped build a gateway outside the building. The 1489 and 1512 inscription also both note that members of the Jin family, who were from Ningzia, also donated to the synagogue. Records from Christian travelers attested to the existence of Jewish communities in three other cities. The famed Italian traveler, Marco Polo, wrote that there were Jews in Beijing in 1286, and said that the Yuan Emperor showed respect for four religions, with Judaism being one of them. Two later missionaries confirmed the existence of Jews in Beijing. Additionally, Catholic Bishop and missionary Andrew of Perugia wrote a letter to Rome stating that they were unable to convert the Jews of Quanzhou. A Jewish community also likely existed in Nanjing, as a Portuguese missionary claimed that he last four remaining Jewish families in Nanjing converted to Islam in the early 17th century. Demographics, disaster, and their isolation from all other Jewish communities led to the downfall of the Jewish community in Kaifeng. As mentioned earlier, the 1642 Kaifeng flood was the most destructive event in the history of the Kaifeng Jews, and marked the beginning of the decline of Judaism in China. Their homes and the synagogue were destroyer; the Torah, as well as other sacred texts, was also submerged, although some texts were rescued and copied after a few Jews swam in to save them. For over a decade afterward, the Kaifeng Jews rented a large house on the north bank of the Yellow River, which they used as a temporary synagogue until the city was ready to be resettled. The synagogue rebuilt on the same site in 1663, and thirteen rewritten Torah scrolls were placed inside. These Torahs, which were eventually sold to Christian missionaries when the community declined in the late 19th century, were nearly identical to the Torah reading the rest of the world. To many matters worse, the Manchus who founded the Qing dynasty in 1644, were unfriendly to religious minorities in China. The Qing took away the powers of minorities to solve their own civil matter and judicial cases. Furthermore, as disputes between the Qing Dynasty and the local Muslim and Christian populations became more common, the Qing became more hostile toward all non-Chinese religions. Muslim rebellions in China during this time were brutally suppressed, and as most Chinese did not know the difference between a Jew and Muslim, Jews started hiding their Jewish identity to avoid oppression. Around the same time, increased activity by Christian missionaries made the Qing grow even wearier of foreigners. Eventually, the Qing banned all Christian missionaries from China. This negatively affected the Kaifeng Jews because they had used the missionaries as a way of keeping in contact with Jews in other countries. During the Qing Dynasty, a disdain for all things foreign caused the Chinese to close their borders even more, further isolating Chinese Jews. To make matters worse, all other Jewish communities in China had already disintegrated by the early 1600’s. Due to China’s xenophobic policies, by the middle of the Qing Dynasty, the Kaifeng Jews were no longer in contact with any other Jewish communities. Their small number and lack of contact with all other Jews made the Jews of Kaifeng more susceptible to losing their identity than ever before. There is almost no information available about the Kaifeng Jewish community between 1725 and 1850. We know that some time in the early 18th century, the Shi family repaired the synagogue. More notably, in 1810, it appears the last Rabbi in Kaifeng died and no one could be found to replace him. In 1849, a British Counsel visited Kaifeng and wrote that there were under 1,000 remaining Jews, and they looked just like the Han Chinese. He wrote than there was no longer any worship, as no Jews knew Hebrew, and the community was no longer sure which day was the Sabbath. Unable to produce any leadership, the Kaifeng Jewish community fell apart in the 19th century. The Yellow River floods of 1841, 1849, and 1860 destroyed the synagogue and further damaged the community. As they could no longer read Hebrew, poor Kaifeng Jews sold most of their holiest book to Christian missionaries for a few pieces of silver. Even the Torahs, which they had once been unwilling to even show to Christians, were sold beginning in 1851. Few Jewish practices remained, but the community still maintained some sense of identity. Even in the 19th century, the Jews still had their own burial grounds, would not eat pork, blood, or any unkosher animals, and would only eat meat they slaughtered for themselves. The Jews became so desperate, they posted their holy Hebrew books in the city square and offered a reward to anyone who could translate them, but no one could. In 1900, Egyptian and Iraqi Jewish merchants who had settled in Shanghai tried to contact and revive Judaism in Kaifeng, but their effort was too little, too late. In 1914, the Jews finally sold the site of their synagogue to an Anglican Bishop, finally parting with the land they had worshipped upon for over 700 years. The merchant economy of ancient China brought Jewish traders to the region as early as the eighth century. Jewish merchants travelling the Silk Route settled in the far western region of the country in the city of Pien-Liang (today’s Kiafeng), capital of the Honan province. Jews were officially allowed in Pien-Liang in 960 C.E. and built the Purity and Truth Synagogue, the first in the region, in 1163. The community thrived through eight centuries, reaching its height in the 17th century at 5,000 members. But following generations of war, poverty, and religious isolation, the Pien-Liang Jewish community significantly declined. The poverty-stricken community lost many Jewish traditions, including the knowledge of Hebrew, and by the mid-19th century, the community’s last rabbi had died, long after the position of rabbi had become hereditary. The synagogue, repeatedly destroyed by floods, was finally demolished in around 1860. Today, the community has begun to repair itself and is trying to reconnect with the world Jewish community. In Keifeng, an estimated 500 to 1,000 residents have ties to Jewish ancestry, though only 40 to 50 individuals partake in Jewish activities. It is speculated that this lack of religious affiliation is due to the strict police surveillance of religion under the Chinese government, despite the emergence of Capitalism. Citizens affirm their Jewish identity discreetly to avoid incuring official displeasure. The community as a whole manages to maintain only a few traditions, such as refraining from eating pork and mixing milk and meat. As the Keifeng Jews try to reach out to the world Jewish community and return to their Jewish roots, they face a number of obstacles, including poverty and lack of knowledge about Judaism. By adopting the Chinese patrilineal tradition, the Kiefeng Jews are no longer considered Jewish according to Orthodox Judaism. Nevertheless, the community is determined to reeducate its members and convert to revive Judaism in China. Jews of Kaifeng, late 19th or early 20th c.
China’s growth as a leading economic power combined with the remodeling of Kaifeng into a tourist destination has led to a greater acceptance of Jewish expression in the city. Tours of the city’s historical sites are given, which give foreign Jews access to the remains of first synangogue and various synagogue relics, including a massive stone water jar and a large stone stele, both dating to 1489. These artifacts are located in the Kaifeng Municipal Museum, while other Jewish relics are housed in various museums worldwide, such as the British Musuem in London and the Royal Ontario Museum in Canada. The stele, originally one of many that decorated the synagogue, is inscribed with the history of the local Jewish population and how Jewish families recieved Chinese patronymics. A Ming emperor gave the Jews the typical Chinese surnames Ai, Gao, Jin, Li, Zhang, Shi and Zhau because he found Hebrew names confusing. Five Chinese women from the Kaifeng community made aliyah to Israel to pursue Jewish studies at Jerusalem's Midreshet Nishmat in February 2016. The women, all in their twenties, will undergo a formal conversion process by the Chief Rabbinate, will receive Israeli citizenship, and will have living and other expenses covered by the Shavei Israel organization. The last time Kaifeng Jews made aliyah to Israel was in 2009, when a group of seven young men made the move. Although the Kaifeng Jewish community claims less than 1,000 members, during 2015 the government of President Xi Jinping initiated a wide crackdown on non-government approved religions. Typical anti-Semitism remained rare throughout this time, but uncertainty about Western influences and the desire to control the people drove suspicions of all minority religious groups. In the late nineteenth century, communities of Russian Jews settled in Harbin and Tientsin, especially at the urging of the Russian government, which aimed to construct a railway to eastern Asia and needed population centers there. The Russian government, eager to populate the cities, encouraged minorities such as Jews and Karaites to move to these cities. As the religious freedoms in Eastern Europe became more limited and as pogroms in the Pale of Settlement increased, many Jews joined these Southeast Asian communities, raising the Jewish population of Harbin to 8,000 by 1908. In June 2014, China announced that the 105-year-old Harbin Tongjiang Street synagogue would reopen after a year-long restoration project. The restoration was done in collaboration with Dan Ben-Canaan, an Israeli scholar who has lived in Harbin for more than a decade and works there as director of Heilongjiang University’s Sino-Israel Research and Study Center. Shanghai, a port city in the Kiangsu province in Eastern China, opened to foreign trade in 1842. Subsequently, the city of Shanghai absorbed many of the Ashkenazi émigrés fleeing repression in Eastern Europe. Russian Jews fleeing persecution and massacres under the Tsar also emigrated and built the Ohel Moishe Synagogue in Shanghai in 1907. But the majority of the Shanghai Jewish population was Sephardim from Baghdad, Bombay, and Cairo, including the wealthy families Sassoon, Kadoorie, Hardoon, Ezra, Shamoon, and Baroukh. These families raised the Jewish population of Shanghai to approximately 700, including 400 Sephardim, 250 Europeans, and 50 Americans. Most of them were merchants, although some were in medicine, teaching, and diplomatic service. Jews fleeing the Russian Revolution of 1917 further increased the Jewish population and raised awareness for the Zionist movement. Then in the 1930s and 40s, Jewish refugees from Germany and German-occupied areas fleeing the Nazi regime increased the Shanghai population to approximately 25,000. Lubavitch Hasidim, as well as remnants of the Mir and Slobodka Lithuanian yeshivot (Jewish religious schools), found refuge in Shanghai, which became a frequent destination because the free port did not require visas. Between 1933 and 1941, Shanghai accepted approximately 18,000 Jewish refugees who fled from the horror of the Holocaust in Eastern Europe [Watch a video thanking Shanghai]. Of these Jewish refugees, 14,000 lived in the “Designated Area for Stateless Refugees,” located in Tilanquiao Square, along with other refugees from all over the world. The Tilanquiao historic area is still very much alive today. Japan captured Shanghai in 1937 and closed it to further immigration in December 1941. They deported most of their Jews to the miserable Hongkew district of Shanghai and kept them in unsanitary semi-internment camps under Japanese occupation forces. The Shanghai Jews, including the transferred Japanese Jews, suffered great economic and property loss during the war, after which, most left to the United States, Britain, Israel, Australia, and other communities. Since 1948, 1,070 Jews from China have immigrated to Israel, with 504 leaving between 1948 and 1951. The Shanghai Jewish Refugees Museum illuminates the area's Jewish past. The museum offers daily free tours every 45 minutes. The permanent exhibit at the Museum houses over 140 high-quality photographs and a multi-screen projection area showing a short film about the refugees who lived in the area. A new museum exhibit opened in August 2015, including historical materials and testimony from refugees who took shelter in Shanghai. In 2015, a replica of the White Horse Inn, a popular gathering place for the Jewish community that was destroyed in 2009, reopened. Ron Klinger, 74, the grandson of the café’s co-founder, who grew up in the cafe, said: “The White Horse was like cafe, bar and nightclub. It was very popular, a place of refuge for Jews who had escaped the Nazis.” The cafe is located next to the museum. Plans are also being made to open a memorial park that will serve to replace the four Jewish cemeteries in Shanghai that over the years were damaged or destroyed. Today, there are about 2,000 Jews living in Beijing, a city of 17 million. A handful of Jewish communists came to this city decades ago but a growing number of secular and then Orthodox Jews have settled there recently, bringing along their families and their traditions. For the past 30 years, the world’s Jews have been coming to China to take part in the rapid transformation and surging economic development. A small group of North American Jews first came to Beijing in the late 1970s. A congregation was established, called Kehillat Beijing, as a part of the Reform movement. The first Passover Seder was held in 1980 and then High Holy Day services were held in a hotel conference room, starting Friday night Shabbat open houses soon after. Jews from Europe and the Soviet Union began arriving during the 1980s. When China established diplomatic relations with Israel in 1992, a joint Seder was held between Kehillat Beijing and the Israeli Embassy. The congregation began holding regular Friday night services in 1995, followed by the first brit milah in 1997, along with a Kehillat Beijing Sunday school. Today, the Ahavat Yitzhak school teaches 40 children. Although Kehillat Beijing does not have a permanent rabbi, the congregation now boasts approximately 50 families. The Chabad House in Beijing is located at the end of a quiet street in an upscale gated community inside Fourth Ring road and down the block from the Israeli Embassy. Rabbi Shimon Freundlich serves as Beijing’s Chabad-Lubavitch rabbi, arriving in Beijing in 2001. Chabad makes sure to work within the centralized Chinese system by allowing only holders of foreign passports to attend prayer services and cultural activities, and refrains from public advertising. The synagogue is technically in Rabbi Freundlich’s home, since free-standing religious buildings are forbidden. In 2002, Rabbi Freundlich’s wife opened Ganeinu International School, an accredited Montessori school that educates about 50 children up to age 12 from a diverse range of Jewish backgrounds and various levels of observance. Chabad provides teachers for Kehillat Beijing’s Sunday school, which shares Ganeinu’s building, and the two communities come together for religious holidays. The community has grown from 700 to 1,500 people in the last seven years. Chabad has established a downtown location in the city’s central business disctrict as well as a community center. A womens-only mikveh, Mei Torah, was established, and a ritual slaughterer flies in from South Africa every three months to meet the kosher dietary needs of the community. In March 2007, Beijing’s first (and only) kosher restaurant opened, called Dini’s, which was open 24 hours, six days a week during the 2008 Summer Olympics Games, providing kosher food for athletes in the Olympic village, as well as snack baskets for spectators. An estimated 5,000 Jews live in Hong Kong at least part-time, as the community is very transient. The Jewish Community Center, which opened in 1995, is the main location for Jewish events in the city. Right next door is the Ohel Leah Synagogue, a Modern Orthodox synagogue that boasts a membership of 190 families. Rabbi Asher Oser has led the congregation since 2010. Rabbi Stanton Zamek leads the United Jewish Congregation of Hong Kong, a Reform congregation of 170 families. The congregation is approximately 60 percent American, relatively young and career-oriented. Chabad Hong Kong is led by Rabbi Mordechai Avtzon and his wife Goldie and has been in the area since 1987. There are two Sephardic Orthodox congregations in Hong Kong, both with mostly Israeli congregants, that were established in the 1990s. Both have glatt kosher restaurants and are open to the public. Today, China’s Jewish community numbers around 2,500, though nearly all live in Shanghai. Led by Chabad-Lubavitch Rabbi Shalom Greenberg, efforts are underway to revive the Jewish community. A small Jewish Museum exists in Kaifang. Israel and China established formal relations in 1992 and ties have grown increasingly close in recent years. In September 2013, Tel Aviv University President, Professor Joseph Klafter, and Professor Zhang Zhi, President of the Jiao-Tong University in Shanghai, China, signed an agreement for the establishment of a special research center for Israel Studies at the Chinese college. The research center, which will address contemporary issues in the Middle East and Israel, is the first of its kind in China. The agreement was signed in the presence of the Israeli Ambassador to China, Matan Vilnai, Israeli consular officials and representatives from the business community as well as the Jewish community. Kaifeng’s tourist bureau can arrange tours, guides, traslators, and access to the Qingming park Jewish museum building and jewihs section of the municpal museum to visitors. Sources: Original article written by Eli Braun.